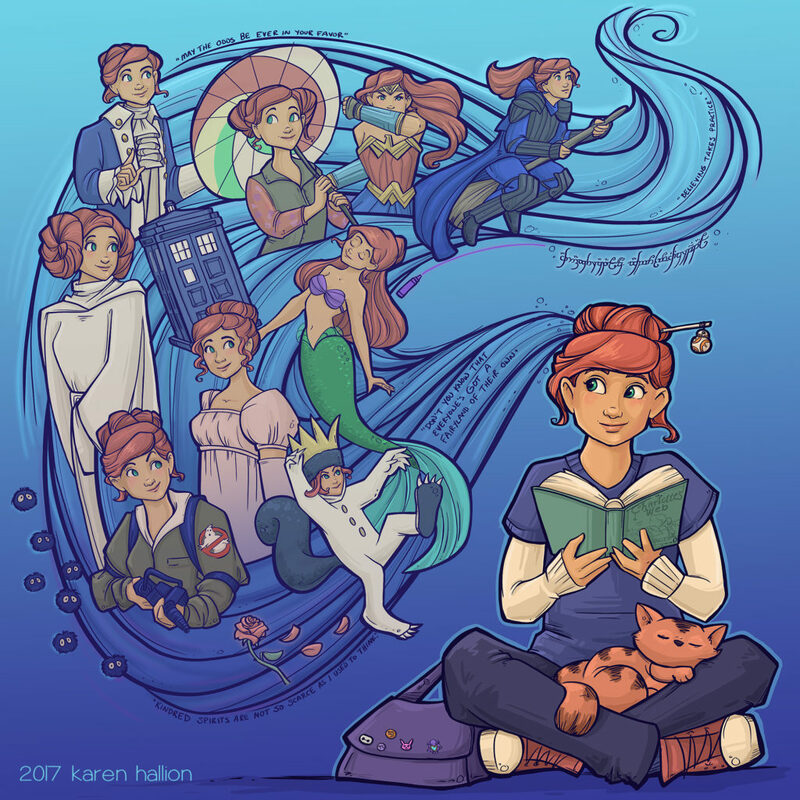 Karen Hallion is one the artists from Star Wars: Women of the Galaxy. She was kind enough to answer a few questions via email for this interview with 365 Days of Star Wars Women. What was your introduction to Star Wars? Were you a fan before you were hired as an artist for this book? If so I’d love to know if you have a favorite film/TVshow/character. I saw Star Wars when I was little, I don’t exactly remember when, but I was four when it came out. I watched and re-watched the original trilogy a lot when I was growing up. I’ve been a fan my whole life. My favorite character is Leia and my favorite Star Wars movie is Empire Strikes Back. If you could transport yourself into the Star Wars Universe which character would you like to meet and during what time period? Hmmmm, that’s a tough question. I think I’d like to meet General Organa and be a part of trying to save and rebuild the resistance. I actually don’t do well with describing my work; I’m a little too close to it. I love line and am heavily inspired by Art Nouveau. It’s whimsical and almost always focused on a girl or woman. I like to try to tell a story with my art and hide a lot of subtle things in the background. 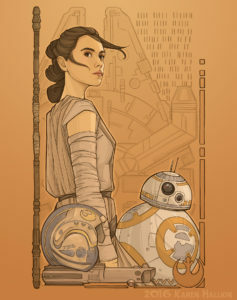 Art by Karen Hallion for Star Wars Celebration 2015. Can you tell me about some of your previously licensed Star Wars art? How did you become a licensed artist for Celebration and how much freedom did you have when it came to what characters you would illustrate? To get into Celebration is tricky. There is a two-step process where the first round is open to any artist that has previously created licensed Star Wars art. You submit a portfolio and get approved to move to the next round. Then, for the second round, you submit a concept of your piece, which can be whatever you would like to draw really. 20-30 artists are chosen from that group to be a part of the show. I was lucky enough to get into Celebration 2015 and 2016, but did not get into 2017. I am about to submit my concept for the 2019 show, so fingers crossed. It’s super competitive and all the artists are extremely talented, as well as huge Star Wars fans themselves. “Beyond Jakku” by Karen Hallion is a licensed piece sold by Acme. Your bio says that you’ve done some work for Her Universe. I’m curious what that work was and if it was for clothing if knowing people are going to wear your art – instead of hanging your art on their wall – changes anything about your process. They were very specific with their art direction, but in general, when I work on apparel, I tend to think about the design being independent of borders, if that makes sense. That was a dream job for me and I love when I see someone wearing one of those items. Can you tell me about the Celara Project and the Wizard School Project? Celara is a character that I have been working on for a few years. Celara is a name that was born out of my love of a series of books by author David Eddings. Back when I was in my twenties, I took two of my favorite characters from those books and made a new name from them. Polgara and Ce’Nedra were combined to make Celara and it has been my online alter ego ever since. Her little companion’s name is “Reverie”. I created Celara because I want every little girl who has been bullied for wearing a geeky shirt or told they couldn’t like something because it’s “for boys” to know that they’re not alone. Also, I want to celebrate what being a geek really means; to explore why we create fan-art, participate in cosplay, and engage in dialogue discussing the minute details of the characters and stories we love. Celara is my homage to how we all connect with each other through these things. Last Fall we successfully Kickstarted a calendar featuring Celara as a young woman. This past summer, I took those illustrations and put them in a book with text for each page; it’s called “A year in the life of a Geek Girl” and is available on my Etsy store: This Spring, I am hoping to Kickstart a children’s book featuring Celara as a young girl. The Wizard School project is a card game created by Hank Green from DFTBA. He asked me to design and create the illustrations for all of it and it was a huge project that took me about a year to complete. It was a lot of fun to work on and really pushed me out of my comfort zone as an artist. “La Dauphine Aux Alderaan” by Karen Hallion. 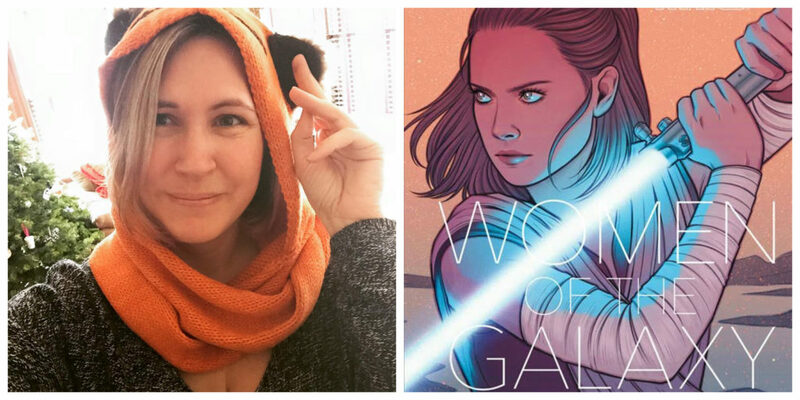 Do you know if one or more of your previous pieces caught the eye of the person hiring the artists for Star Wars: Women of the Galaxy? I don’t know if any particular piece had an impact. I’ve been a fan of Amy for a while and follow her writing on various blogs and I know that she has been following me as well. I feel like there is a network of geek girls who follow each other online. 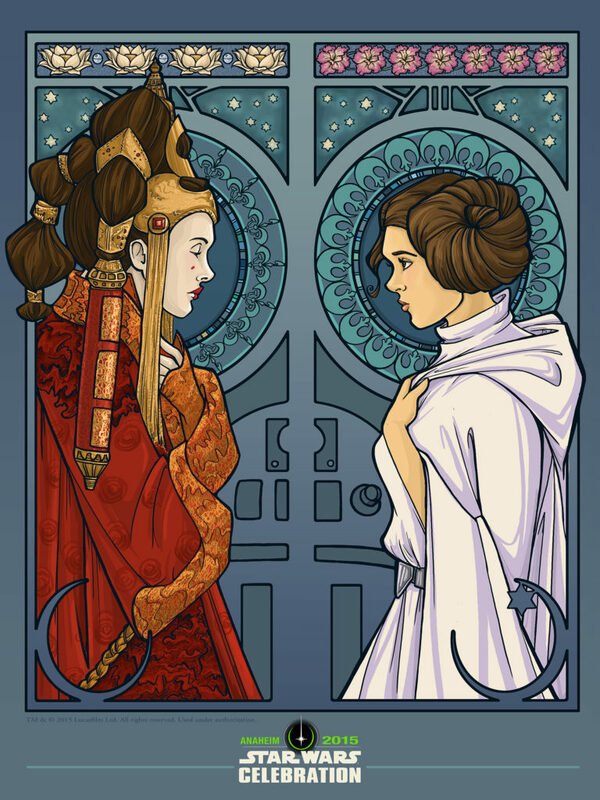 I did an art nouveau illustration of Princess Leia a few years ago, early on in my career that really got me noticed in the Star Wars “geek girl” community. It’s one of my favorites that I have ever done, actually, and Jennifer Heddle an editor at Lucas Books has told me that she owns it, which makes me so happy. I am so incredibly grateful for the opportunity to work on this book; it really was a dream come true. Did you have any say on which characters you were going to illustrate for this book? Were you very familiar with all of the characters you drew? No, we were assigned the characters to draw. I had eight characters, and there was only two that I wasn’t very familiar with: Bo Katan and Queen Trios. It was nice to do some research and learn more about them. Was there one character that was more difficult to draw than the others? Queen Trios was tricky because I couldn’t find a lot of reference for her. I wasn’t sure what her outfit was supposed to look like and I didn’t want to copy what the comic book artists had done themselves. I didn’t want to make a mistake and draw something that didn’t fit with her story. Did you look at other illustrations of this character before you started your work for Women in the Galaxy? I did look at other illustrations of her before drawing as she was not ever in a show or movie. The only references I could find were comic book illustrations of her. 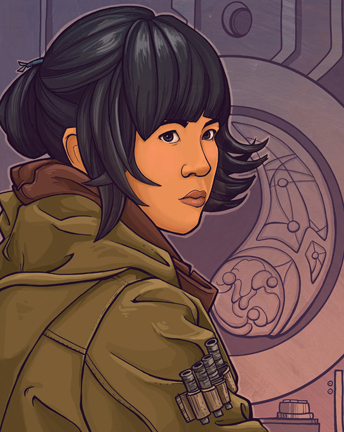 Rose Tico by Karen Hallion in Star Wars: Women of the Galaxy. Do you have a favorite Star Wars character to draw? Or is there a character on your to-do list you’re looking for an excuse to draw soon? I always come back to drawing Leia; I have the most illustrations of her than of any other character in any other story. I am not sure I will ever get sick of drawing her. I do want to do more of Ahsoka, I love her story as well. Do you have any advice for artists just getting their start? Every artist will say “draw every day” and it’s cliché but true. I have been drawing every day for thirty years. When I take more than a few days off, I definitely notice. Someone once told me or I read it somewhere, to just do good art and get it out in front of people. Even if it seems like you are putting your art into a void and no one is seeing it, just keep putting it out there, consistently. Eventually, the right person will see the right piece and your career will start moving forward. Opportunities, for me, came out of exactly that, just the right person seeing the right illustration at the right time. Basically, draw every day, put your art out there, have faith in yourself and don’t give up. Sounds easy, but it’s not. I’ve definitely had many moments of doubt and frustration but then in the end, when you get to do something like this, it’s so worth it. I am mainly working on my children’s book which is another big step out of my comfort zone. It’s mainly drafted now and I am working with an editor to tweak the story and the writing. I am hoping to Kickstart it in early March. You can see more of Karen’s work on her website and on Twitter.